I want to give a big thank you to the printers who have generously donated the print of the promotional materials for the BBC Children in Need ZUMBATHON 2010 they are: Paul at www.printsynergy.co.uk, Ben at www.spectrum-graphics.co.uk and Simon at www.printroom.co.uk. With flyers, banners, A Boards and posters we are hoping to raise massive funds for the event. Thank you guys - much appreciated! Having had the pleasure of working with all three of them I can recommend their services whole heartedly. 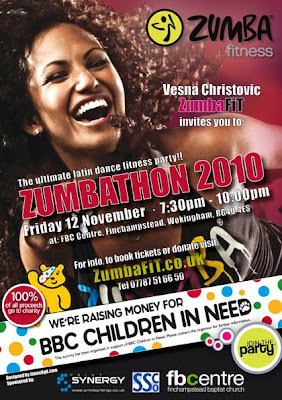 After last years tremendous success the BBC Children in Need ZUMBATHON 2010 will be held on Friday, 12th November at the FBC Centre, Wokingham.